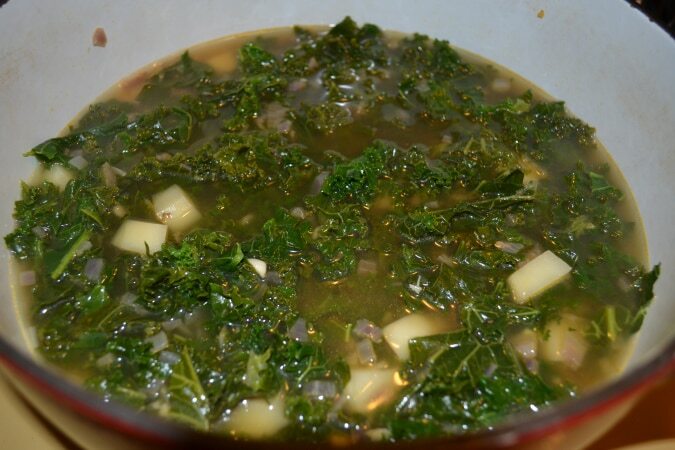 A hearty soup chock full of kale, chorizo, potato and aromatics. I first had this soup as a kid, at my babysitter Florinda’s house. She was Portuguese, and her kitchen was always filled with delicious smells and flavors. I didn’t know what I was eating at the time, but I knew back then that it was damn good. 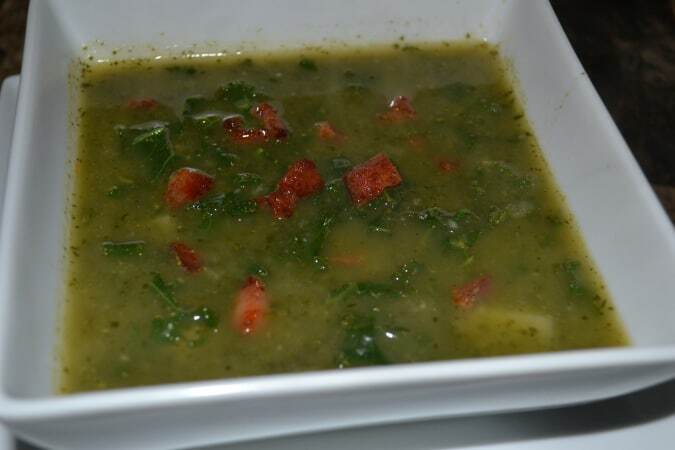 So after many years, I had this soup again as an adult at a local Portuguese restaurant, I finally learned it was called Caldo Verde! This soup is super satisfying, and super healthy! It’s full of tons of kale, with just the perfect amount of salty, fatty goodness from the chorizo. You can lighten it up even more by using turkey chorizo, if you can find it! 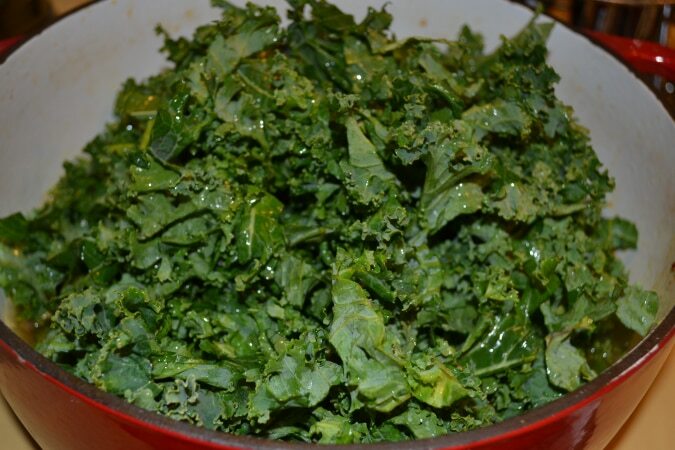 Kale is a hearty and delish green, and it’s super good for you! However, you have to remove the center stem of the leaf, it’s just too woody. To remove the stem, fold the leaf in half to expose the stem. Pull the leafy green parts away from the stem. To shred the leaves, stack a few leaves on top of each other. Roll them into a tight roll, like you’re rolling a cigar. Slice the roll of kale into thin strips. Now onto the chorizo! There are 2 types of chorizo, fresh (uncooked) and cured (cooked). You are looking for the cured (cooked) type. Spanish chorizo is typically sold already cooked, so look for that. It’s chock full of paprika and garlic, so this super flavorful ingredient goes a long way. Let’s cook! Place a Dutch oven or large pot on medium heat, add in the olive oil and the chorizo. Saute the chorizo for 2-3 minutes, until it’s crispy. The paprika in the sausage will ooze into the olive oil, giving it a spectacular golden color and a delish flavor. When the chorizo is crisp, use a slotted spoon to remove it from the pan. Set the chorizo aside. Throw the chopped onion into the paprika olive oil and season with a pinch of salt. Saute for 4-5 minutes, until it’s tender and translucent, but not browned. After the onion is tender, add in the garlic. Saute for 1-2 minutes, until the garlic is fragrant. Add in the chicken stock/broth. Toss in the cubed potatoes. Add in 2/3 of the kale and a pinch of salt and pepper. Reserve the last 1/3 for later. 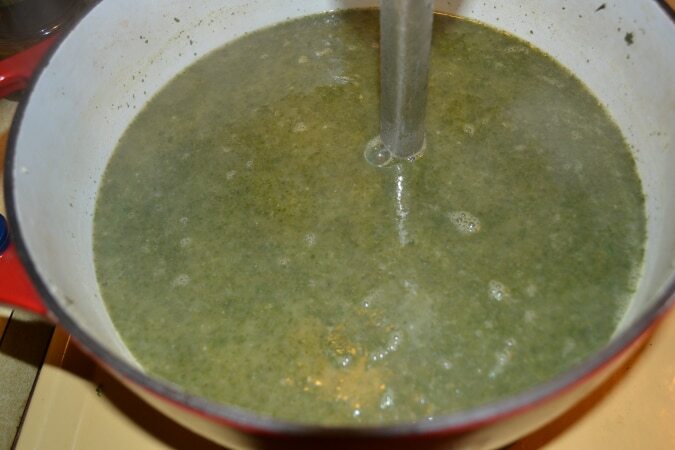 Bring this mixture to a boil, then reduce to medium low and cover. Cook for 20-25 minutes, until the potatoes are tender. When the potatoes are tender, blend the soup with an immersion blender or a regular blender. 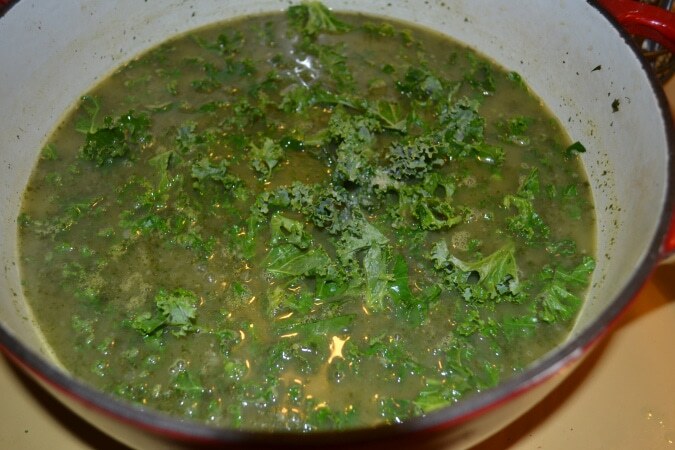 After blending the soup, add in the rest of the kale. Cover the pot and cook for another 10 minutes, until the kale is tender. Taste the soup for salt, then season with salt and pepper to taste. Serve up a hearty bowl of this soup, and sprinkle a bit of the chorizo on top. You can add a sprinkle of Parmesan cheese and olive oil if you want to kick it up a notch! Remove the woody stems from the kale leaves. To remove the stem, fold the leaf in half to expose the stem, then pull the leafy green parts away from the stem. Stack a few leaves on top of each other. Roll them into a tight roll, like you're rolling a cigar. Slice the roll of kale into thin strips. Place a Dutch oven or large pot on medium heat, add in the olive oil and the chorizo. Saute the chopped chorizo for 2-3 minutes, until it's crispy. When the chorizo is crisp, use a slotted spoon to remove it from the pan. Set the chorizo aside. Throw the chopped onion into the pot and season with a pinch of salt. Saute for 4-5 minutes, until it's tender and translucent, but not browned. Add in the chicken stock/broth, potatoees, 2/3 of the kale and a pinch of salt and pepper. Reserve the last 1/3 of the kale for later. Bring the soup to a boil, then reduce to medium low and cover. Cook for 20-25 minutes, until the potatoes are tender. An inside look at the Celebrity Constellation kitchen!